Book Review: "George III: America's Last King"
The latest installment in Yale University Press' English Monarchs Series is Exeter University historian Jeremy Black's George III: America's Last King. This first full-scale scholarly biography of George III in many years is a welcome addition to the series as well as a fine example of the biographer's craft. Black has worked diligently (his subtitle notwithstanding) to broaden the focus of George III's life and reign; while the American crisis and the king's later illnesses are covered, they form only appropriately-scaled portions of the book, as they should. Black takes a useful approach here, interspersing narrative chapters on the political machinations and military goings-on with more wide-ranging thematic treatments of different aspects of the monarch's life - his relations with family, his cultural and religious inclinations, his lifestyle and his concerns for how to deal with Hanover, his ancestral continental possession. These thematic chapters were what I enjoyed most about the book - the others, while interesting, were filled to bursting with names and titles and political volleys that I found difficult to keep straight. George III, Black argues, "instinctually knew what his duty was ... a major weaknes was that this conviction was not always illuminated by careful reflection, and could therefore seem both obtuse and stubborn" (p. 115). It was this commitment to what he perceived as his duty to his country and to his subjects that led him to take such a firm stand against the American crisis (unsuccessfully) and also against Catholic emancipation, parliamentary reform, and Franco-European aggression (more successfully). "George was a nicer man than his two predecessors and he meant well, but his obstinacy helped create serious political difficulties," Black concludes, putting it mildly. Naturally I was drawn to Black's discussion of George's reading habits: the king accumulated a large working library (some 65,250 books by 1820, plus 19,000 tracts), which later became part of the British Museum. He opened his main library - next to his bedroom - to use by scholars (Samuel Johnson was a frequent visitor), and was known to visit Windsor bookshops. Black writes "George was particularly interested in works on theology, history, jurisprudence, science, the arts and the Classical inheritance, and less so in fiction ... Indeed, George did not really take to novels until he became blind, when one of his daughters read them to him nightly" (p. 170). The king liked to read interesting portions of his books aloud, and preferred "his books unbound for his first reading and afterwards bound to match his other books" (p. 171). Black's excellently-researched and richly-footnoted study will, I hope, prompt others to take a fresh look at the life of one of Britain's most longest-serving and - frankly - most interesting, monarchs. Three Robert E. Lee letters sold at yesterday's auction fetched a combined $61,000, the AP reports. The 440 Civil War documents together are estimated to have sold for approximately $400,000 ("neither [owner Thomas] Willcox nor the auction house had specific figures"). "Fewer than 50 people gathered for the auction of old correspondence, telegrams, bills and receipts. Two of the Lee letters were sold to an out-of-state collector bidding by phone. David Ellison of Columbia spent $27,000 for a Lee letter that talked about using slave labor to build defenses. ... Willcox said he was disappointed with the sales. He said he's sure he at least broke even after spending money on legal fees and $70,000 for a detailed appraisal of the documents. 'I thought it would have gone better,' he said. 'At the end of the day, it's over.'" So ... a multi-year legal battle with the state of South Carolina and the wholesale destruction of a Civil War letter collection, all to break even. Book Review: "Of a Feather"
Given the sustained and growing American interest in birding over the past few years, we were about due for an updated history of the field; Scott Weidensaul's Of a Feather: A Brief History of American Birding (Harcourt, 2007) fills this gap admirably. Weidensaul provides a concise synopsis of the development of American ornithology, sketching out the biographies and artistic/observational styles of Mark Catesby, Alexander Wilson, Audubon and other early "birders." This may be familiar territory, but Weidensaul's treatment of later figures such as John Townsend, Charles Bendire, George Bird Grinnell will be fresh to some readers. Of a Feather succinctly covers the great debates over the formation of American ornithological institutions, the "feather wars" that prompted protective actions and the beginnings of conservation efforts. The section of Weidensaul's book I enjoyed most were the chapters on the rise of field guides; he examines the genesis of the genre and then contrasts the early efforts with Roger Tory Peterson's revolutionary guide before examining how field guides have evolved in the decades since Peterson. Also, the discussion of comparatively-recent trends toward competition and "list-mania" is both instructive and important - Weidensaul argues that many birders today are too obsessed with ticking off species names while neglecting the big picture of conservation and ecosystem preservation. He writes "Now bird study is poised to enter what could be a fresh and, I hope, golden age. My hope for the future is a fusion of the science of birds with the love of chasing them, the best of the ornithologist and the lister, with a vehement commitment to avian well-being binding these approaches together" (p. 313). Not a bad vision. Well-written and nicely readable, this is a good introduction to the subject. Weidensaul's citations and bibliography provide many additional sources. The Associated Press reports that a collection of 444 letters between Confederate military and political officials will be sold at auction today in South Carolina. The letters have been the subject of a long legal battle between their owner and the state of South Carolina: "Willcox's letters were supposed to be auctioned in 2004. But the state stepped in and sued, claiming they were written as part of official state business and were the property of South Carolina. A federal judge ruled last year that Willcox owned the collection, which were in his family for generations before he discovered them in his parents' home after they died." Each letter will be sold separately, so the collection is likely to be effectively destroyed by today's sale. "One entity that won't be trying to get the documents is the state. Officials from several agencies have told The Associated Press that South Carolina won't be bidding - in part because they have been recorded on microfilm. 'To spend the state's money on something we believe already belongs to the state goes against principle,' said Charles Lesser, senior archivist for the Department of Archives and History." While it's good that the collection has been microfilmed and so is (presumably) available for research purposes, it's a shame to see such an interesting group of documents separated. An institutional home for them would have been most appropriate. Via Shelf:Life, news from Lincolnshire that Thomas Ashton, 22, " stole more than 120 books from the University of Lincoln library between October 2006 and July 2007." Ashton, who graduated from the university this summer, sold more than 60 books on eBay before a buyer noticed the library stamp and called police; another 69 books were discovered at Ashton's home. Ashton told police he'd carried out the thefts by "photocopying the bar codes of the books he did not like and attaching them to the ones he wanted so he could disable the security tag and leave the premises without arousing suspicion." I wouldn't think that method would work, but apparently it did in Lincoln. Ashton "expressed remorse and regret and said he was willing to pay all of the costs to the university"; magistrates ordered him to pay £1,500 in compensation to the library, plus a £500 fine and £43 in court costs. Once again judges pass up a perfect opportunity to set an example. The Guardian has a special web report on "Writers' Rooms", with short essays by quite a few well-known writers on the places where they do their work; each essay is accompanied by photographs. What surprised me is how similar so many of them are. The New York showroom of Bloomsbury Auctions held its inaugural sale yesterday, the library of Pamela and Richard Estes (which I first mentioned here). The auction brought in $780,000 hammer price, with the Kelmscott Chaucer fetching $180,000. A 1909 Ashendene Press edition of Dante's works was sold for $57,600, well above estimates. Bill Cole of Cole & Contreras Books recently posted to ExLibris some interesting printing techniques he's come across in cataloging a few 18th-century books. He calls them "stupid printer tricks," but they actually seem pretty ingenious to me. An copy of the Magna Carta dated 1297 - the only one of seventeen original copies in private hands - will be sold at auction at Sotheby's this December. The copy, which is owed by Ross Perot's foundation, was until recently on display at the National Archives in Washington. "The foundation told the archives this month that it had decided to end the loan and take back Magna Carta. Its departure came so suddenly that the archives did not have time to remodel the display case or fill it with some of the nine billion documents from the archives’ own collection." Perot bought the Magna Carta in 1984 for $1.5 million. It is expected to fetch up to $30 million this time around. According to a foundation employee quoted in the Times, the foundation decided to sell the document in order to "have funds available for medical research, for improving public education and for assisting wounded soldiers and their families." Sotheby's is trumpeting the sale as "The Most Important Document Ever Offered at Auction." - J.L. Bell at Boston 1775 points out a Marcus Rediker piece in a recent Boston Globe which makes for fascinating reading. Rediker, who's written several provocative and important books on pirate culture, has a new book coming out soon, The Slave Ship: A Human History. Amazon recently sent me an ad for that ... they do know me well. Rediker's Globe essay centers around this document, which is one of the most disturbing satires I have ever read. - Ed has some more of his always-excellent bibliaudio offerings, including a radio play of Marlowe's "Doctor Faustus." Ed also recently commented on "Robinsonades" - literary spinoffs of a sort. - Scott Brown reports on a very small and intricate Koran being sold at auction this week. - From BibliOdyssey, fish engravings by Adriaen Collaert, and an eye-popping collection of advertising trade cards. - Jim Watts at Iconic Books notes the display of the "Devil's Bible" in Prague. - The LibraryThing folks are mulling a data-merge with Google . The debate over there on this question has been really enlightening. - The NBCC's retrospective on W. Jackson Bate's Samuel Johnson continues with a short essay by Jack Lynch. - From the Telegraph, a John Sutherland column on Jasper Fforde (which I highly recommend to anyone who enjoys Fforde's works) and a review of Andrew Lycett's new biography of Arthur Conan Doyle. - To lighten the mood, Colonel over at Mutterings has a few sure-to-be-bestsellers, as ripped from the headlines. - Michael Lieberman passes along a video tribute to Edward Gorey's The Gashlycrumb Tinies. - NPR recently noted that a complete set of signed Harry Potter books is being auctioned off for charity. You've still got a couple days to bid! I'm heading out of Boston early Saturday morning for a quick trip home to visit family and then to alma mater for a few days of thesis research with my favorite book collection (more about which soon). I'll be posting as I can, but probably not quite as regularly as usual. The Calcutta Telegraph reports today that administrators at India's National Library "have stumbled upon 500 forged membership cards, allegedly issued by a section of employees. The scam follows an exposé of a racket, also involving employees, that smuggled out several rare books." "The recipients of the forged cards [which have numbers already assigned to actual patrons] are mostly foreign nationals, who come on a short visit to the city for research. 'Instead of going through the elaborate process of enrolling as a member, they find it convenient to bribe employees and obtain forged cards. The racket has been active for quite some time,' [an anonymous Library] official said." A previous media report ("Priceless periodicals pilfered") revealed that "some employees were smuggling out copies of the rare Bengali periodical Kallol, making photocopies and selling them. Most of the originals are yet to reach [i.e. be returned to] the shelves." Everett Wilkie passes along the latest updates from the Davy Crockett story, in the form of a post on the Houston Chronicle's Texas Politics blog. Seller Ray Simpson submitted this affidavit last week to the Texas Historical Commission: "I am writing this letter of provenance regarding a letter dated January 9th, 1836. This letter was sold to my grandfather in the mid to late 1980's by a person purporting to be the great-great grandson of David Crockett. The letter is composed of one page handwritten on the front and the back. In it, the author discusses the beauty of Texas and his desire to make Texas his home. The letter is signed at the end 'David Crockett.' I have no reason to believe anything other than what was told to me by my grandfather. I have no financial proof of purchase because of the length of time between then and now." "Meanwhile," the post continues, "the Texas Historical Commission said it will issue a request for qualifications of experts to determine the letter's authenticity by the week of September 24, at the latest. And Simpson has released the state from the financial expense of holding the $550,000 purchase price in escrow. The final sale requires proof of authenticity within 120 days." A first edition Book of Mormon found recently in an upstate New York estate sold at auction yesterday to an undisclosed East Coast buyer for $105,600 (including commission). The NYTimes reports that the bidding was largely remote: "Six bidders were on the phone, and another five were absentee bidders who had put in a maximum bid beforehand. Both groups were primarily from California and Utah, where the largest concentrations of Mormons live. In six minutes, the bidding ended." The auction record for a first edition Book of Mormon was set in March, when a copy signed by early church leader Orson Pratt sold for $180,000 at Swann. This new sale bears out Ken Sanders' comment "you'll be hard-pressed to find any first edition sold for less than $100,000." So far, his prediction is holding up just fine. On this "Talk Like a Pirate Day" (arrrr! ), I thought it appropriate to point out a writeup in the Waterbury (CT) Republican-American of a current exhibit at Yale's Beinecke Library, "The Very Picture of Transgression: Visions of Pirates since 1650." From the exhibit description: "The 'Golden Age' of Western piracy (ca. 1650–1730) spawned an extraordinary amount of lore and legend - and the pirate representations inspired by these legends continue to proliferate today. This exhibition charts the expansion and development of the Western pirate's image, from its inception in early trials and swashbuckler histories to its position in the romantic and sometimes lurid depictions by twentieth-century artists. Printed documents and original art from the Beinecke Library's collections illustrate the evolving image of the pirate and its multifaceted, shifting role in music, theatrical arts, adventure tales, and reportage of the past three and a half centuries." The exhibit runs through 31 October. Columnist Scott Hollifield of the Winston-Salem Journal has some fun with the Crockett Contretemps. The British Library has announced the winners of its Hidden Treasures contest, in which public libraries from around the UK were invited to submit noteworthy collections for potential digitization. Five winning projects were selected. Full list of winners, runners-up and other entrants here. This week over at Critical Mass, the blog of the National Book Critics Circle, there will be a series of essays revisiting W. Jackson Bate's Samuel Johnson, the winner of the NBCC's general nonfiction prize back in 1977. The first installment comes from Jerome Weeks, who writes '... as affectionate, as first-hand as Boswell’s Life is, Mr. Bate’s has the benefits of range, of context and distance (and, inevitably, more sources than were available in the 1780s). He uses all of these shrewdly, giving us vivid and affecting portraits of Johnson’s friends, the period’s politics and publishing industry. He provides analysis of Johnson’s prose style, his humor, his shabby poverty, his failures, his faith, his achievements with the Dictionary, his edition of Shakespeare and, finally, his crippling ailments, both physical and psychological." Of the book's staying power, Weeks concludes "Since Mr. Bate’s life first appeared, scholars have pried away various pieces of Johnson and Boswell for closer, rewarding examination -- as with Mr. Sisman’s Boswell’s Presumptuous Task or Charlies [sic] Pierce’s The Religious Life of Samuel Johnson. But in those 30 years, no one has written a biography of the great man that can touch it." Every disease seems to have its book these days; Stephen Bown's Scurvy: How a Surgeon, a Mariner, and a Gentleman Solved the Greatest Medical Mystery in the Age of Sail (St. Martin's, 2004) at least treats one of the more interesting of the bunch. Bown has written a fairly good account of scurvy's impact on the English navy during the age of exploration through the Napoleonic wars and the long and circuitous effort to discover its cause and effective treatment options. Unfortunately he does little in a comparative way; discussing how scurvy affected other maritime nations during the time period and how non-English authorities went about trying to conquer it might have improved the book's scope nicely. That said, the discussion of English attempts to figure out a cure for scurvy is decent. What surprised me - as it seems to have surprised Bown and others - is how many times the cure (ascorbic acid) was discovered, written about, and then promptly forgotten again, leading to the deaths of countless sailors as dozens of different ineffective methods were tried. Bown also offers biographical sketches of James Lind, James Cook and Gilbert Blane (his surgeon, seaman and gentleman), the three men perhaps most responsible - even if slightly indirectly - for the eventual end of scurvy as a serious threat to British naval might. Aside from some noticeable repetitions, my major problem with Scurvy is the lack of citations. Bown throws this in his reader's face, writing in the "Note on Sources" "Because this is intended as a popular rather than scholarly book, I have elected not to include footnotes in the text." How insulting to assume that any reader - "scholar" or no - couldn't benefit from the inclusion of citations. The festivities start on Wednesday night, 19 September, with a talk by John Quincy Adams biography Lynn Parsons at the MHS, "The Yankee and the Tsar: John Quincy Adams and Russia." Refreshments at 6 p.m., lecture at 6:30. RSVP to 617-646-0560. Adams served as the first American ambassador to Russia, 1809-1814. A dramatic presentation, "John Quincy Adams in Russia," will be performed by Parsons and actor Jim Cooke at the Old South Meeting House on Thursday, 20 September at 6:30 p.m. This show will also be mounted at the American Antiquarian Society in Worcester on 18 September at 7:30 p.m. and at the Amherst Center for Russian Culture on 23 September at 3 p.m. This event is supported by funds from the Massachusetts Foundation for the Humanities and the U.S.-Russia Chamber of Commerce of New England, Inc.
And the grand event of the fall will be the exhibition we're about to unveil here at the MHS: 'Moments of Destiny': Two Centuries of Russian-American Diplomatic Relations from the Collections of the Massachusetts Historical Society. The show will be available for public viewing every day from 27 September through 31 October from 1-4 p.m.
J.L. Bell at Boston1775 has some more on the JQ Adams angle and on the events, so certainly stop by there too. - The week's must-read is Jill Lepore's excellent and provocative New Yorker review essay of Edward Larson's A Magnificent Catastrophe, a new book out on the election of 1800. - From the NYTimes, an essay by David Oshinsky on gleanings from the "rejection files" at the Knopf archive at the University of Texas. - Paul Collins points out his latest New Scientist article, which he calls "the most disturbing article I think I've ever written." "In perhaps the least-known American medical scandal of the 20th century, tens of thousands of woman in the 1920s through 1940s -- and the number might even reach into the 6 figures -- received X-ray radiation to their faces and arms" for the purpose of removing unwanted hair. "By 1970, US researchers were attributing over one-third of radiation-induced cancers in women to X-ray hair removal." - The BBC covers a new bright-light technology that might allow scholars to 'read' unrolled scrolls or other works too fragile to open. - BibliOdyssey sends roses, by Pierre-Joseph Redouté. - Lew Jaffe's got a bookplate tale for us. - Travis has more on the Transylvania thefts, pointing out that "masterminds" doesn't quite describe the thugs who carried out that heist. He also offers a brief update on the Jay Miller case; he suspects there's a plea deal in the works. - Ed comments - aptly - on the latest effort to claim Shakespeare didn't write the plays. - From The Scotsman, a celebration of the five-hundredth anniversary of printing in Scotland, and a column by Stuart Kelly on the recent flood at the National Library, "an accident that acts on the bibliophile part of my brain like salt on a slug." - Michael at Book Patrol has some really neat images by Briony Morrow-Cribbs, and also offers a sneak peek at the design for Prague's National Library of the Czech Republic (which looks like something out of "SpongeBob Squarepants" to me). - In The Guardian, Andrew Lycett draws on recently-available letters by Sir Arthur Conan Doyle to piece together a long-unclear "marital dilemma." - Megan Marshall gives Linda Colley's The Ordeal of Elizabeth Marsh a quite-positive review in the NYTimes. The Houston Chronicle reports the latest from the Crockett Contretemps: on Friday, Texas Historical Commission head John Nau told the paper that the dealer who sold Texas the Davy Crockett letter "is no longer requiring the purchase price to be held by a neutral party until the authenticity of the document is verified. ... Nau did not elaborate or explain further, although he said the contract is still in force as the state attempts to determine authenticity." It's not entirely clear what the immediate implications of this move are, but it is becoming increasingly more likely that Simpson Galleries will never see that $550,000. "Nau said the commission is seeking 'the absolute best forensic analysis and expert handwriting analysis' and defended the state's contract and splashy announcement, saying officials wanted to prevent anyone else from buying the letter first." He did not announce the names of those involved with the consultations. "Catherine Barnes, an autograph dealer, just put out a list that includes a letter from Jefferson in which he orders books from Europe soon after he sold his library." The letter, written 31 January 1816 to George Ticknor in London, includes a list of books that Jefferson wants added to a previous order. They include a 1796 edition of Cicero's works in French (10 volumes), as well as several other Cicero titles. For a mere $25,000, it could be yours! The cataloging of TJ's library on LibraryThing is proceeding apace; we've done about 1,300 titles so far, and have started adding Jefferson's "reviews" as they were included in Sowerby's bibliography. This has proven very intriguing, and I think people have enjoyed seeing Jefferson's views on Plato, Noah Webster, Laurence Sterne and others. I know I have. I really enjoy the book coverage in The Scotsman, and a short bit in today's Tim Cornwell piece is exactly why. Cornwell's discussing the newly-created Byron Centre at the University of Manchester, which he says has "brought a sniffy response from experts associated with the Murray Archive, now installed in the National Library of Scotland. 'He had nothing ever to do with Manchester,' says one, adding it was time Scotland claimed 'that well known poet of Aberdeen' for its own." That's just the first paragraph. And then, the final twist: "So far the Manchester collection includes a small handbag made by Byron's childhood love, Mary Chaworth, thirty years of writings from an amateur British researcher, and a bust by a Greek sculptor." Ouch. Talk about a sniffy response. I hope those actually involved with the respective archives are a bit more amiable toward each other. I'm well behind the eight-ball on this story, but lest I be accused of anti-Antipodeanism, I feel duty-bound to post on it (plus, it's neat). 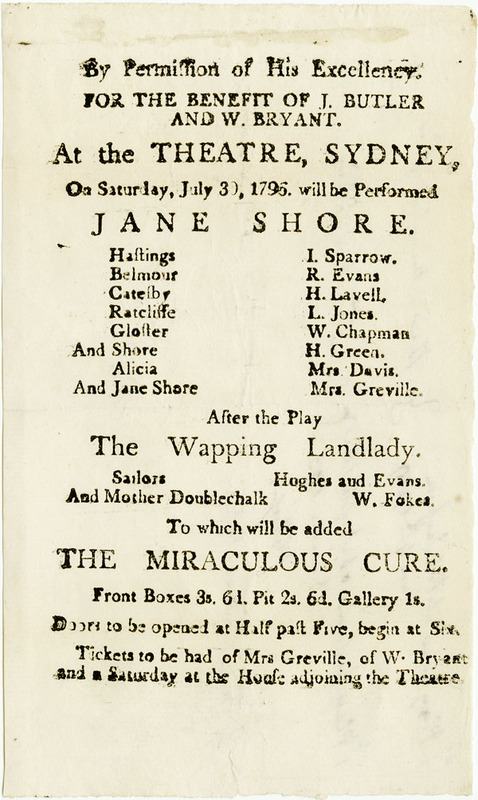 The playbill was recently discovered by librarian Elaine Hoag "inside a 150-year-old scrapbook that had been donated to Library and Archives Canada (LAC) by the Library of Parliament in 1973." Its path from Sydney to Canada is not yet known. Very cool find, and awfully nice of Canada to allow for its return to Australia. * Jane Shore was a mistress of Edward IV. Hessney Auction Company in upstate New York has announced that they've found an 1830 first edition of the Book of Mormon while clearing out an estate in Palmyra, the small town where Joseph Smith founded Mormonism. The book will be sold at noon on 19 September as part of a combined estate auction. Book Review: "The Witch's Trinity"
Set in early sixteenth-century Germany, Erika Mailman's novel The Witch's Trinity (forthcoming from Crown) is a well-written, gripping and chilling account of a witch scare in early modern Europe. Told from the perspective of an elderly woman, I suspect this book gets as close as possible to what living through one of these crises must have been like. As famine tightens its grip on the village and a well-fed friar armed with inquisatorial devices arrives to root out the evil cause and destroy "her," suspicions multiply. The narrator must defend herself, even as her dreams bring her visions and horrors more than sufficient to send her to the stake. As a look into the minds and perceptions of people who sought supernatural causes for their misfortunes, this novel works well. It's not one of the best I've read this year, but I would recommend it nonetheless. I can't remember the last time we had two major biblio-news stories occurring at the same time like this - between the Crockett Contretemps and the Truro Trouble there are many updates to report this morning. Crockett first, I guess, and as usual Scott Brown's got the inside track on all the new developments there. Here's the Texas Historical Commission press release (now removed from their site, according to the Houston Chronicle) announcing the purchase of the letter, and here's Scott's take on the THC's announcement that an expert panel will be convened: "Once again, the state of Texas has it all backwards. First, the governor personally announces the purchase before anyone does even basic analysis and now that the document is questioned, Texas is hiring the experts." On ExLibris, Kevin MacDonnell posted yesterday that he sent a statement on the letter to several Texas papers, "and suggested that in the interest of public trust and transparency that they [the Texas Historical Commission] make the names and qualifications of their 'team of experts' known, including full disclosure of any connections, past or present, that those experts might have to the buyer or seller, as well as any court or state agency complaints ever registered against any expert on their team." I certainly hope they take his advice. Scott also questions the dealer's story about finding the letter in a folder "tucked away in a desk." Does seem a bit fishy, doesn't it? Switching gears, things are also moving quite quickly with the story I wrote about on Monday regarding the sale of the Phillpott Library by the Truro diocese. Local papers and the BBC are reporting that the diocese is "seeking legal advice to see if it has any cause for redress after losing out from the sale." Pulling double-duty here - and doing so incredibly well - Scott has some important updates for us on this story too, as well as an important question that I've been trying to answer since December and will cast upon the waters now. He reports that the collection was originally appraised by a representative of the Society for Promoting Christian Knowledge in 2002 for £20,000 (making Thornton's later £36,000 offer seem pretty decent). blade in hand, and cut out the 300 best drawings and prints, leaving the rest. The auction house, Dominic Winter, subsequently placed the remainder with an American university library. Anyone know where it ended up?" That bible is the one I've posted about here (the post includes some new comments as this story has grown); since I first read about it in December I've been trying to figure out which American library it was that accepted the book after that wretched dealer (who has thus far managed to remain anonymous) took his razor blade to it. If anyone knows and can share, please do. The Scotsman reports that five floors of the National Library of Scotland were flooded last night after a contractor broke a sprinkler pipe. "Firefighters and library staff worked through the night to salvage the threatened parts of the collection. Some modern books and manuscripts suffered 'surface' water damage, but all of the 'important, iconic' books were saved," the paper notes. A spokeswoman for the Lothian and Border Fire Services said they responded to a call around 11:30 p.m. last night, arriving to find "heavy flooding. We isolated the sprinkler system before assisting staff who were wrapping up books." National Library officials said the major collections were already being protected in case of construction damage, and that those materials which did sustain damage are currently being evaluated to determine the best treatment options. Everett Wilkie passes along an Ian McKay article [PDF] from the Bookdealer on the sale of the Phillpotts collection. The Houston Chronicle has today's update on the Davy Crockett letter saga - the Texas Historical Commission has now "retracted" spokeswoman Debbi Head's statement that they're "99.9% sure" of the letter's authenticity. "That was not the position of the commission at all," Commission executive director Lawrence Oaks told the paper, calling Head's words "a misstatement." "Oaks said the commission will issue a 'request for qualifications; next week seeking experts skilled in forensics and other forms of historical document analysis. He said the document, offered by Houston dealer Ray Simpson III, would undergo scientific tests to determine the age of the paper and the ink, as well as other types of analysis. ... A team might be assembled rather than one individual, standard practices will be applied and the search for experts will be nationwide, he added. The commission hopes to move quickly and will exclude anyone with an 'ax to grind' or a conflict of interest." In a classic case of "you don't know what you've got 'til it's gone," an English diocese is regretting the 2006 sale of its collection of pre-1800 books and manuscripts for £36,000, since auction sales alone have brought the purchasing dealer up to £500,000, The Times reports. The diocese of Truro decided in 2004 to sell off its holdings, solicited a few bids, and eventually accepted that of John Thornton, who put some of the items up for auction and made a hefty profit at it. Thornton "has now closed his shop in Chelsea, West London, and has told The Times that he is planning to retire to the country." Diocese spokesman Jeremy Dowling told the paper "Those on the management committee had no idea of the value of the material they were dealing with. The decision was made in principle that the pre-1800 collection be disposed of simply because in the past ten years no one had inquired about any book in it at all. Therefore, the library management committee felt that the space was being taken up in a way that was not productive. What Mr Thornton bought, he bought in good faith. The difficulty arises as to whether or not the trustees were sufficiently aware of what was going on." One wonders how exactly the collection was catalogued so that people knew the books were even there to be inquired about. I've written about one of the books in question before: an extra-illustrated Macklin Bible sold in December by Dominic Winter for £47,000 (purely for the Old Master prints within, which the buyer then removed for further - more lucrative, if less ethically kosher - sale). Yes, you read that right - a single book from the collection sold for £11,000 more than the dealer paid for the whole lot, as the report notes. Auctioneers and rare book dealers agreed that the diocese ought to have shopped around. Dominic Winter told the paper "The fault, if there is a fault, lies with the people looking after the library because they did not cast around. We do not think that they went to any auctioneers in the first place or get any more quotes for the job." Alan Shelley, president of the ABA, said "No one knows what happened down in Truro. Clearly, some great error has been made somewhere along the way, at what stage and by whom I do not know." For his part, Thornton told The Times "I was invited to make an offer to clear the books and two years later I took them away. It was difficult to give an accurate evaluation of the collection when we were asked to do so in 2004 because of the dimly lit and confined conditions in which they were held." I'd like to think that this case would make institutions like the diocese think more carefully about decisions taken to deaccession important collections like this, but of course in these days of budget-crunches it probably won't. To a larger point, if the collection was gotten rid of purely for space management reasons, the diocese ought to have considered donating it to a repository where it could have been kept intact, rather than having it sold off piecemeal. Unfortunately, that's all water under the bridge. - First, some updates: Scott Brown continues to stay on top of the evolving Davy Crockett letter story, including some important orthographical comparisons. He also heard from one autograph dealer who said that the $490,000 price tag was "a bargain" if genuine (though I'm still not sure why, given prior auction prices), but that "The uniformity of the writing certainly should cause a lot of concern. Davy Crockett did not write on straight lines like that." Finally, Scott's dredged up some earlier examples in which the dealer who sold this letter to Texas has been involved with the sale of non-genuine documents. - Travis has been chasing down a very strange episode involving book thief Sherman Suchow [aka Charles Merrill Mount]'s testimony to the Senate Judiciary Committee during the confirmation of Supreme Court Justice Stephen Breyer. Here's his lead-up post, followed by a summary of the Mount's submission. - Speaking of thefts, I happened to flick on the t.v. yesterday afternoon and stumbled on an episode of Fox' "Masterminds" about the 2004 thefts from the special collections department at Transylvania University. Naturally it's a bit overdone (it is Fox, after all), but on the substance they did fairly well. - Hanover College (IN) has mounted a web version of their ongoing Captain Cook exhibit. - At Book Patrol, Michael highlights some Edward Gorey news, including an exhibit of Gorey's Dracula work at the Cartoon Museum and a brief Harvard Magazine profile from earlier this year [pdf]. - Joyce catches some great biblio-news bits that missed my radar screen on the first pass; don't miss any of these. - Before he jumped into the Davy Crockett fray, Scott posted an excellent volley in the Google Books debate, dismissing the argument that Google Books is not a good tool in this way: "... any 'ordinary' reader who blindly assumes that a free scan of an out-of-copyright edition of a complicated eighteenth-century book is a good source for reading gets what they pay for. This is the problem with most information on the Internet. You have to use it with care because you don't know by whom or for what purpose it was put online. ... In short, it doesn't matter if you are reading a book online using Google Books, checking one out from the most prestigious library in the world, or buying a brand-new copy from your local bookstore, the advice is the same caveat lector." I'll have more on Google Books soon since I've had some interesting interactions with it recently. - Richard Davies lists the biggest ABE sales for August, in which a special edition of Harry Potter and the Deathly Hallows (one inscribed at Rowling's midnight reading) sold for $5,500. The highest-seller for the month was a complete copy of Athanasius Kircher's Itinerarium Exstaticum Quo Mundi Opificium, which fetched $11,728. - Rare Book Review notes the recent sale at auction of a copy of Francis Frith's Egypt, Sinai and Jerusalem: A Series of Twenty Photographic Views (1860). The hammer came down at £63,250, more than three times the presale estimate - quite a haul for a book discovered during an attic clear-out earlier this year. - In today's NYTimes, John Wilson reviews Of a Feather, Scott Weidensaul's new history of American birding. I'm looking forward to this one; my copy is staring at me from the "to read soon" shelf as I type. - And finally, as work on the Great Jefferson Library Project continues (quickly! ), an article from The New Yorker on another of Jefferson's passions - wine. Sarah Messer's Red House: Being a Mostly Accurate Account of New England's Oldest Continuously Lived-In House, is, oddly enough, just as described in the subtitle. Messer tells two stories with this book: the history of the house in question (in Marshfield, MA) and its longtime occupants - multiple generations of the Hatch family - and also a personal narrative of her experiences growing up in the house after her father purchased it from the Hatches. Both parts have fascinating elements, and it's clear that Messer has researched the historical sections fairly well (there are delightfully detailed notes for some portions, even if they are unmarked in the text and all jumbled together at the back). I found the historical sections and the chapters dealing with the preservation/documentation process more interesting than the personal reminiscences, but I'm sure others would be inclined to think precisely the opposite. If you're a fan of autobiographical musings I'm sure those bits would be enjoyable. There was a bit too much speculation for my comfort, which I wouldn't have minded if Messer had made it clear in the text rather than relegating many of her leaps to the notes. Overall, though, not a bad casual read. Three thefts to report this morning, sadly. We have just discovered a major theft of all of our vintage postcards and valentines from our retail store in Hillsdale, Michigan. This theft entails thousands of items and is valued at more than $150,000 dollars. The items range from vintage postcards to cdvs to vintage valentines and greetings cards and 150 Stereoview Cards. Please Forward let us know if you have any leads regarding this theft. "Yesterday there was a theft of several books from a locked case at Bookman's Alley in Evanston, Il. Several Ezra Pound 1st editions were taken along with a 1st printing of Twain's, Celebrated Jumping Frog. Please be on the lookout for these. If you need more details please feel free to call Roger Carlson (847) 869-6999. He does not have working email at this time. You can also email me if necessary. And via Everett Wilkie on ExLibris, this announcement that an atlas containing 48 maps by Hugo Allardt and F. de Wit was stolen from a private residence in Brittany on 30 August. It would appear that the state of Texas recently forked over $490,000 to purchase a copy of Davy Crockett's 'last letter,' written two months before he died at the Alamo. First, Scott introduces the story and provides images of the Texas letter and a known Crockett holograph letter. Then, some hi-res handwriting comparison and the note "If I had to guess, I'd say this was a fair copy of the letter, not a forgery - that is to say, if the letter turns out not to be in Davy Crockett's hand, the person who made it didn't intend to deceive, s/he simply wanted to make a copy." Soon Scott heard that the Texas Historical Commission was "starting the verification process" and has up to 190 days to cancel the purchase, and was told by a "leading autograph dealer" that in the Crockett letter purchased by the state, "none of the characteristics of Davy Crockett letters I have on file show up." Then came the price comparisons, in which Scott showed that Crockett letters rarely fetch more than $25,000 at auction, let alone $490,000 (the gallery owners who sold the letter to the state are quoted as saying "The document likely could have sold for a much higher price in an open auction, ... but the family wanted to offer it to Texas first." Eventually, Scott received word from Debbi Head, Senior Communications Specialist at the Texas Historical Commission. She told him that the letter was purchased quickly, before authentication: "The opportunity to purchase came pretty suddenly, and we didn't want to let it slip away." Until the verification process is complete, she said, the money paid for the letter is in escrow, and they'll be "looking to procure the best forensic and signature experts" to check out the letter. Seems to me that whoever's responsible for this purchase at the state level got a little bit ahead of the game. This morning, the Associated Press reports on the questions raised, including comments from Everett Wilkie and Kevin MacDonnell saying that the letter is almost certainly a fair copy, judging by the correct spellings and punctuation, handwriting, &c. Most surprising is the quote from Ms. Head, who told the AP she's "'99.9 percent sure' the letter is real. 'We just want to have it authenticated by our experts to put us at 100 percent certainty that this is the real document.'" Seller Ray Simpson agreed, saying "I am very positive that this is the original Davy Crockett letter. We do think it's right, and we do think it will be proven through the state's third-party investigation." I guess we'll just have to see about that; it certainly looks like a fair copy to me. Bloomberg reports that 99 lots of ornithological books and prints from the collection of the late Chicago philanthropist Brooks McCormick will be sold at Sotheby's in New York on 5 October. The auction proceeds will go to the International Crane Foundation. The full Sotheby's catalog isn't online yet, but Bloomberg notes that the sale will include 90 prints from Audubon's Birds of America, a first edition of Darwin's On the Origin of Species, and (drum roll please) a copy of Mark Catesby's Natural History of Carolina, Florida and the Bahama Islands (that's expected to be the high spot, estimated to fetch up to $600,000). Another one I'd like to be a fly on the wall for. Richard at Bytown Bookshop passes along the scoop on a major upcoming auction: Bloomsbury New York will sell the collection of Pamela and Richards Estes on 26 September. The highlight of the sale is a beautiful copy of the Kelmscott Chaucer (first picture), one of just 48 copies bound in pigskin. That's expected to fetch as much as $300,000. The sale will also include several incunabula, a 1502 Aldine edition of Dante (the first work to include Manutius' anchor device), a significant number of early printed books, and a huge selection of private press books, including many others from Kelmscott. I'll make a note to check the results of this one, we might see some noteworthy bids on some of these items. Book Review: "The Last Witchfinder"
James Morrow's The Last Witchfinder (William Morrow, 2006) is, without question, one of the most enjoyable novels I've read this year. A bit fantastical, it offers a nice escape from the bonds of traditional literature through a fascinating narrative structure that I was delighted to see employed effectively (done poorly, this book would easily have been a horrendous mess). The novel, you see, is written by Newton's Principia Mathematica, who occasionally breaks into the narrative to offer super-textual commentary (such as a very funny explanation of how it is that existing books, not human authors, create new works of literature and prose ... and Hallmark cards) - think Fforde plus Eco with a hint of Borges and a healthy dash of Neal Stephenson. At the core of the novel's main plot is Jennet Stearne, daughter and sister to witchfinders, niece to a woman wrongly executed as a witch whose dying wish was that Jennet disprove the supernatural basis of those events people interpreted as sorcery. A task easier said than done, but our heroine accepts the challenge. Naturally, the path is neither short nor smooth. With appearances from Isaac Newton, Ben Franklin, Baron Montesquieu, Abigail Williams of Salem infamy and other characters factual and fictional, The Last Witchfinder is a rollicking book-trip through the eighteenth-century world where rationality and revelation duked it out (just as the Principia and his archnemesis the Malleus Maleficarum engage in a tangential final proxy-battle in the streets of New York). You've got to read it to believe it. Aside from a few minor anachronisms, Morrow (er, sorry, Principia) has penned a fine tale. Prior to the Great Book Move, the only books I had shelved in the open were my books on books and the (several) bookcases full of things recently acquired. The rest were living in the spare bedroom (now my bedroom), in basically no order whatever. Once the shelves were up and I could get everything out of storage, I had the wonderful (but troubling) dilemma of how to organize everything. After much deliberation, I decided to start by shelving everything in order according to the Library of Congress classification scheme (since all my books are in LT, they already had LC numbers, or else I wouldn't even have considered this). I printed out an Excel list, started shelving, and quickly realized how quirky LC can be. On the whole I think it works, but boy is it counter-intuitive at times. More than once I had to check to make sure I was reading things right, thinking it impossible that books so seemingly different would be classed together (or that things that I thought should be adjacent would be in totally different areas). I don't know that I'll leave my shelves in LC, but for now it does the job, and seems less subjective than anything I could come up with myself (which is not to say that it isn't subjective, since it clearly is ... catalogers are people too, after all). It's always interesting (well, to me at least) to hear how other people organize their own books, so if you've got a scheme (or not) that works well for you (or doesn't), feel free to outline it in the comments. Anybody got the perfect system? Michael Lieberman notes that Kansas City book dealer Tom Wayne hauled out the grill again yesterday, but not for the traditional Labor Day fare of burgers and hot dogs ... Wayne decided he needed another publicity infusion, so be burned more books. (Of course the attempt is working like a charm.) This guy's becoming the Britney Spears of the book world ... just when we start to forget he's around, out come the shenanigans. Wayne said that many people have offered suggestions for what can be done with the books he doesn't want, but that "many of the solutions would have involved 'thousands of dollars and dozens of hours' of their time or the people who wanted them were competitors." So naturally he'd rather destroy them than give them to someone else who could use them in some way. Some of us over on LT have been discussing what I think will be an exciting project - entering the library catalogs of a few famous bibliophiles into LT. So far Thomas Jefferson's library (as given here) is the front-runner for the first leg of the effort, but I'd also like to get John Adams' books in as well. Tim's got a post up about this over at Thingology, where he asks "What would be the point? Well, I think it would be cool to see how many books you share with Jefferson. Jefferson's classification system is also of interest, and would go into tags well. More fun, perhaps, would his Tag Mirror. More generally, it would be a fun demonstration of LibraryThing's bibliographic reach and of what committed people can accomplish together. Lastly, although Jefferson's books are—in theory—online, having them in LibraryThing, with links to the printed catalog, would be a big improvement over the current GIFs of scanned pages, and might well draw more people into thinking about Jefferson's books, and how personal collections inform intellectual and political life." Please do come and join the discussion, and I'd invite anyone interested in helping out to jump right in - the more the merrier! Book Review: "Origins of the American College Library"
Though written in 1934, Louis Shores' Origins of the American College Libraries, 1638-1800 remains the standard foundation for studies of early American college libraries. Shores considers the nine colonial colleges, offering brief outlines of their beginnings and the roots of their library collections. In each case, he examines how the collections came to be accumulated, discovering that the books were almost exclusively the result of donations rather than outright purchases chosen by college administrators. Shores argues that while having a library was seen as a key element of an institution's reputation, in many cases the nature of the collections was meant that the books themselves were often outdated and "largely useless" (pg. 229). Those few purchases that were made are discussed at length, as is the available evidence for how libraries were administered, housed, catalogued and used during the colonial period. Much supplemental materials is given here in appendices, including a list of donations to the colonial colleges and information on the various men who are known to have served as librarians. Near the beginning of his book, Shores notes the irony that "libraries so careful in the preservation of all other materials only too frequently have failed to organize and preserve their own library records" (pg. ix), a fact which makes what he accomplished here all the more important. Yes, there are holes (we know almost nothing about the pre-1800 collections at Rutgers, for example), but Shores has worked wonders with the sources available. - BibliOdyssey offers up some Rosicrucian images attributed to Johann August Starck, and also some anatomical/marine engravings from Christoph Gottwald's wunderkammer (1714). - At Critical Mass, Steve Weinberg offers some helpful hints on how not to respond to a book review. - Richard Cox comments on a new book (one I'll have to hunt up), Inscription and Erasure: Literature and Written Culture from the Eleventh to the Eighteenth Century. Cox: "Those interested in the archival impulse will find references in his literary analysis that are of interest, with considerations to the use of wax tablets as the main means of writing in the medieval period, the emergence of autograph signatures and the use of scribes, the availability of printed almanacs with blank pages for personal recordkeeping, the use of handwritten newsletters, and the rise and impact of printed texts." - Michael Lieberman at Book Patrol points out yet another interesting volley in the ongoing debate over Google Books. Michael also has an interview with Chris Doeblin, who recently changed the name of his New York City bookstore to Book Culture. - Rare Book Review writes up a noteworthy upcoming auction: a manuscript poem by abolitionist William Wells Brown will go under the hammer at Dominic Winter on 3 October. - Via Reading Copy, a Richard Reardon column from the ChiTrib on book treatment and his personal views on the subject (dog-earing, writing, highlighting, &c.). - Rachel from Old Saratoga Books announces her piece on this month's Biblio Unbound, "Essentials of a Well-Stocked Home Library - The Reference Section." There are a few other worthwhile articles in the rest of the newsletters as well. - Several others have already noted the arrival of AntiquarianBookNews.com, a Digg-style aggregator. I agree with Scott's comments on this style of site, but I'll check in with it now and then. - Ian's posting updates from the Baltimore Summer Antique Fair, including some photos of his booth and the one across the aisle (which seems, frankly, a bit much). - Paul Collins reports that an original 1855 copy of English as She is Spoke is now available at Google Books. Last week I briefly noted the apparent theft of two maps from a 1482 copy of Ptolemy's Cosmographia housed in the collections of Spain's National Library in Madrid. Today the Times reports that library head Rosa Regàs has resigned in the wake of the thefts, which seem to go beyond the maps: "Police who searched the hall, which is restricted to professional researchers, found pages torn from four other books, dating from the 16th and 17th centuries." Ms. Regàs "accused the Culture Minister, César Antonio Molina, and the press of running a smear campaign against her," and "told reporters that police had asked the library not to divulge information about the losses for fear of hurting the investigation, before volunteering that they had identified the culprit," the Times report notes. " Ms Regàs said that she had been made a scapegoat for the loss, adding that other libraries around the world had suffered similar thefts." Regàs told the press that the suspect is "an Argentinian researcher, ... who was authorised by the Spanish Ambassador in Argentina and had already fled. The Spanish Ambassador [in Buenos Aires] promptly denied the accusation." In an ExLibris post, Everett Wilkie also points out this story from yesterday's Independent, which notes "The embarrassment of the thefts in a library with a supposedly hi-tech security system led deputies in the Spanish Congress to ask questions about the whole affair." I think there are at least a few shoes left to drop in this case, so we'll have to wait and see how things shake out.